Pattaya is one such place where one can have non- stop action in the sun while enjoying oneself to the maximum in a stunning kaleidoscope of fun activities, sports and entertainment. Pattaya used to be a tiny fishing village but now it has transformed itself into a prominent international playground where travelers from all over the world come alive with vibrant activities. Nowhere in Southeast Asia can one find innumerable attractions in such great profusion but Pattaya. Pattaya has poised itself about 150 km. southeast of Bangkok making it easily accessible from the remotest of regions. The place with its majestic stretch of coastline has been perfectly groomed for international travelers for over three decades now. 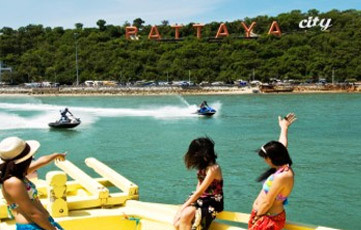 With such extensive development, Pattaya now stands as the most prominent beach resort with a city status in Thailand. 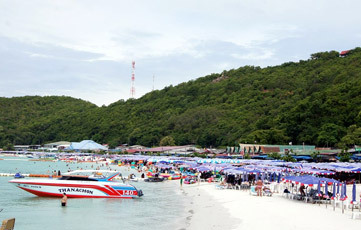 It is the main beach at Pattaya which boasts a majestic 4-km curve adorned with emerald foliage around. The place is highly refreshing with its tropical greenery and tranquil ambiance. The best of water sport can be experienced here with relaxing environs. The northern section is primarily to enjoy and relax where as the southern section is for accommodation, restaurants, nightclubs, stores etc. The island lies about 14 km west off Pattaya with its immensely beatified beaches. The place is known as the most outstanding scuba diving areas in Pattaya with amazing coral reefs. However, one has to reach the place under the supervision of the Royal Thai Navy. For further information one can contact the Ko Phai Tourist Centre at Tel. 0 3842 6401-2, 0 3841 1655-6. It is a temple alike Wat Phra Kaew as it also housed a major Buddha statue at some point of time. However, at present the main highlight of the place is the Lanna-style Ubosot. The timber door panels are also a fascination of the temple which was beautifully carved by contemporary craftsmen of the city. The underwater world in Pattaya endows an amazing insight with the first hand knowledge about the area’s majestic marine life. It is a uniquely updated aquarium which comprises a 100-metre state-of-the-art acrylic tunnel. Visitors take a walk through this tunnel. As they take the walk it seems as if they are walking with the marine species and experiencing the aquatic life. Visitors will come across myriads of species with azure water including the shovel-nosed ray, a hybrid between a shark and a stingray, etc. This exotic place brings you a step closer to the species which now stand extinct. As the name suggest, the park will bri ng you up-close with the life-size replicas of the creatures that lived two hundred million years ago. The place will take you to the Dinosaur Age with the replicas of Tyrannosaurus Rex, a Velociraptor, and a Petinosaurus.